Captain Ben Wolfe with Sport Fish Michigan gives his report for the Michigan area waters during the week of September 21-27, 2015. Early September report includes information about northwest Michigan’s bounty of fishing opportunities in September, including smallmouth bass, walleye, lake trout, coho salmon, and king salmon. September is generally a great time to be out on the water here in northern Michigan as there are many options for anglers. River fishing is stellar, inland lakes are fishing well and the big lake and Grand Traverse Bays are awesome fisheries as well. So many choices, too little time! 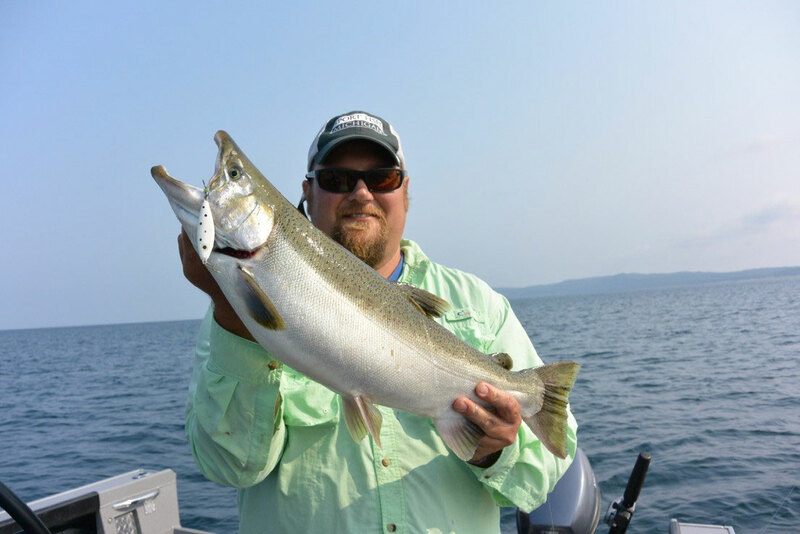 For those getting out onto Grand Traverse Bays, salmon is the preferred target for many anglers. On both East and West Grand Traverse Bays, early morning trolling is one of the best ways to get into contact with these awesome game fish. For East Bay, fishing the southern portion of the Bay is often times the most productive, with a big U-shaped troll pattern along the eastern, southern and western corners of the deep water. A faster troll is necessary for picking up king salmon, as opposed to fishing for lake trout. Spoons a long ways behind a planer board with leadcore lines or long copper lines is day in and day out a highly productive way to fish for these early-morning and late-evening biters. For West Grand Traverse Bay, “the hole” down near the mouth of the Boardman River is one of the most productive spots, and there will be lots of boat traffic to prove it. Salmon congregate along the deep drop-offs near the hole, adjacent to the Boardman River. This a fantastic place to not only troll, as many of the charter boats do, but also to vertically jig for thunderous bites. Salmon become very territorial as they near the spawn, and a big 2 or 3 ounce Jonah Jig bounced in their face is a great way to get an angry king salmon to bite. This is not a snagging technique, as almost all of the fishing is done in 65 feet or more. The proof is in the pudding, because almost 100% of the fish brought aboard Sport Fish Michigan’s boats that jig are caught squarely in the mouth. Platte Bay, in the Sleeping Bear Dunes National Lakeshore is not only a beautiful place to fish, it’s also one of the best options around. When it comes to open water fishing, Platte Bay offers vertical jigging options for lake trout, coho salmon and king salmon, not to mention the occasional school of whitefish that can be caught. It is the salmon, however, that are the main draw to the Bay. Coho salmon and king salmon stage in deep water early in the month prior to coming shallow adjacent to the Platte River mouth. It is here where anglers can cast lures and flies to cruising cohos and kings in water less than 15 feet. This is some of the most stunning visual fishing that can be had in freshwater. There is truly nothing like watching a salmon chasing down a lure in gin-clear water! Sport Fish Michigan is the only fishing outfitter that has permits to guide inside the Sleeping Bear Dunes National Lakeshore, and customers have lined up to book a guide trip. With fishing so good, it’s also no wonder that a few television shows have even taped out there with us the past couple of years. River fishing for salmon is hot in September since this is when the bulk of the fish run into the rivers to spawn. Cured salmon eggs are one of the best ways to get river salmon to bite, whether it’s under a float or side bounced with the current. Long rods help keep the line off the water, giving better line control and contact when that float goes down! Spinners and deep diving crankbaits can also draw vicious strikes, but anglers should keep in mind that every river has different regulations governing the number of hooks and the size of the hooks. Deeper holes and runs hold salmon as they get ready to spawn, and these are prime places to cast spinners and crankbaits as well as to float fish. When float fishing, cast slightly upstream to get the bait to the target depth when coming into the holding areas. When casting spinners and crankbaits, cast slightly downstream. Any upstream cast will likely snag into one of the many woody obstructions that line the area’s rivers. The weather is often times very mild and pleasant in September, and with such great fishing opportunities, anglers should be able to get out to enjoy what northern Michigan has to offer! Just remember that everybody is out to have a good time, and a little common sense and polite etiquette will go along way in everybody having fun regardless if it’s on the river or an inland lake or out on the bigger waterways. As always, have fun and stay safe!